Amazing products designed and produced? Check. So, you’re ready to ship! Now for that question you may not have thought about too much – how do you package your goods for shipping? For many in the Eco Family, this question is about balancing protection, presentation and sustainability. Most importantly, you need to package your goods effectively, so products arrive in great condition. But a close second in consideration is how to create a beautiful unwrapping or unboxing experience. And finally – how do you do this all in a way that is eco-friendly, maintaining the same values you put into developing your products in the first place. If you are grappling with all of this, or frankly if you never even knew you were supposed to be grappling with this – this is the guide is for you! Click on the category of products you produce and read on to explore your options . Custom printing: Remember that almost all of these shipping supplies can be custom printed with your logo and design. So once you've selected your packaging strategy, consider whether or not you want to design it, and truly wow your customers and showcase your brand. To learn more about our custom printing options, click here. And don't forget! Regardless of yopur overall packaging strategy, you might need shipping labels and tape. These are small things that can easily be overlooked, but are critical to the sustainability and life cycle of your shipping packages. T-shirts, socks, patterns, pants, yarn, underwear – whatever apparel or fabric items you produce – you have a few options to consider. Here we describe your options, and the pros and cons associated with each, to help you land on the best option for you. First, a word on paper versus plastic. This is a question we get a lot: If I am trying to be as ecofriendly as possible, should I use recycled paper or recycled plastic packaging? It is not a black and white answer. On one hand, paper is made from renewable resources. Our paper mailers and corrugated boxes are made from 100% recycled material, and are recyclable and compostable. This is all great news! But plastic, especially recycled plastic does have its advantages, particularly when it is made from recycled materials as our products are. Plastic is actually more energy efficient to produce and to recycle. Plastic mailers are also lighter than their paper counterparts, so shipping things like polymailers is more energy efficient. So…what? When it comes to packaging, there is no perfect answer. You’ll want to consider what you specifically need to ship and how it will be best protected in transit and presented to your customer. The following chart describes the products we offer that can be used to package apparel and fabrics, and pros and cons of each. That said, if you were to force us to answer, we would typically recommend our 100% Recycled Poly Mailers for apparel and other fabrics. Why? 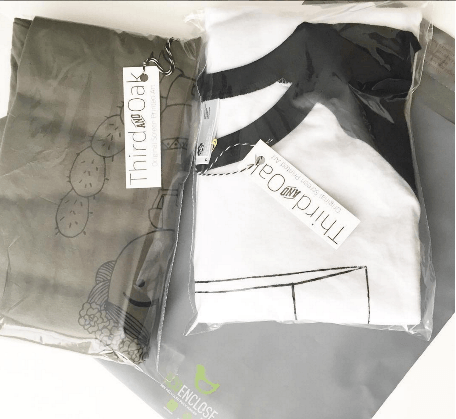 First, ours are the only poly mailers available that are 100% recycled! They are reusable for returns, pliable and water resistant. They take up the least amount of space, which helps both when we ship it to you, and when you store them in your home or warehouse. They are the lightest option, so they are the cheapest for you to ship. And, they are our least expensive option. However, they are not without their downsides and many of our eco minded businesses have made the decision to go different directions. Read on for more context. Not 100% weather proof. A clear Flap & Seal can be used to protect your product. 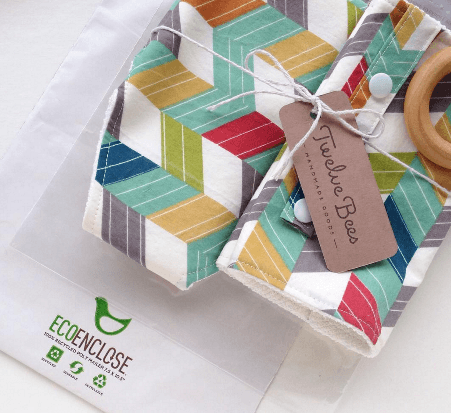 Here are a handful of examples of how some of our customers have packaged their fabric and apparel goods in EcoEnclose products. Twelve Bees produces burp cloths, and first protects them in our Flap & Seal bags, and then packages them in 100% Recycled Poly Mailers. 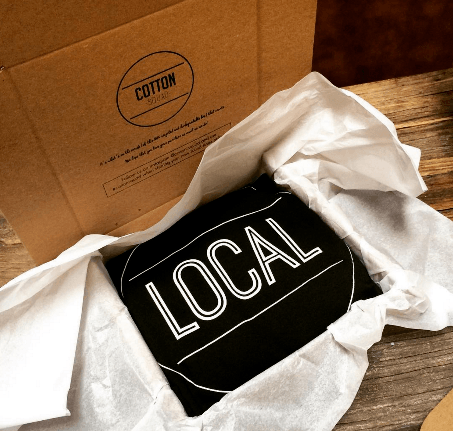 Here, Cotton Squad packages their stylish shirts in a uniquely designed custom cut tab-locking box, with tissue paper for protection and presentation. Here, Third and Oak first protects children’s clothes using Flap & Seal bags, and then packages them in 88% Recycled Poly Mailers. 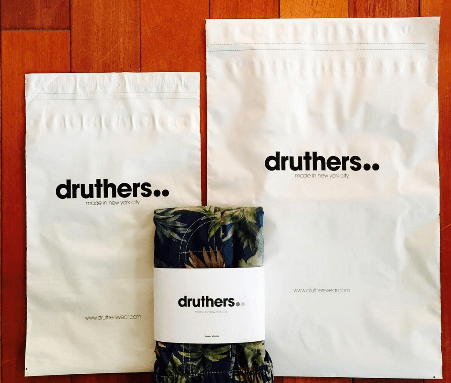 Here, Druthers packages their boxers directly in 100% Reycled Poly Mailers (without using Flap & Seals). Here, Proper Northwest packages their apparel in beautifully designed Padded Mailers. Okay, I think I know what products I want to use, now what size do I need? Here's a handy recommended sizing chart. You may find it helpful to order a sample first, to make sure the size meets your needs! 12 x 15.5" or 14.5 x 19"
6 x 2.5 x 12"
Dress shirt 10 x 13"
Two shirts 10 x 13"
Three shirts 12 x 15.5" 12.5 x 19"
Dress or jeans 12 x 15.5" or 14.5 x 19"
Tea Towel 7.5 x 10"
Napkin Set 10 x 13"
Sheet Set 14.5 x 19" or 19 x 24"
Fabric patterns 9 x 12"
Yarn 10 x 13" or 12 x 15.5"
8.5 x 11" or 10.5 x 15"
Fabric - 1 yd 10 x 13" 9.5 x 14.5"
Fabric - 2 yds 12 x 15.5" 10.5 x 16"
Fabric - 3 yds 14.5 x 19" 12.5 x 19"
You’ve worked hard to create your masterpieces. How do you get them to your customers in a way that ensures they are in pristine condition, and beautifully showcases your work? There are no hard and fast rules, but here are some ideas. From here, you can let your creative juices flow. 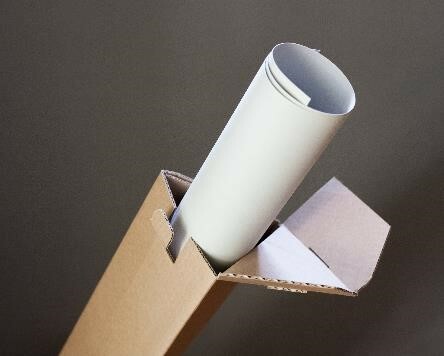 Rolled prints or posters: We recommend a custom cut Triangular Tube (TT) mailers, from our corrugated box collection. Stack of prints or greeting cards: We recommend a custom cut One Panel Fold (OPF) corrugated box or a Rigid Mailer. The larger sizes of the rigid mailers feature clever creasing, allowing them to expand. Framed print: We recommend a custom cut One Panel Fold (OPF) corrugated box. If the print is fragile, consider using GreenWrap, tissue paper, corrugated bubble, or packaging paper to protect your print. A single print: We’ve been so impressed by the creativity of so many in the Eco Family who have come up with incredible ways to wrap, protect and package their prints. Here are a few approaches that seem to work well. Option 1: Rigid Mailer. These are very sturdy mailers and for many prints, can do the trick all by themselves. However, if you think it is helpful, you might consider backing it with a Chipboard Pad. Option 2: Poly Mailer. These are recycled plastic and are not rigid, so artists typically surround prints with Corrugated Pads (PAD, on the custom cut corrugated box page) and protect them using a Flap & Seal. Option 3: Kraft Mailer. These are paper, but are also not rigid. So again, prints could be backed with Corrugated Pads and protected using a Flap & Seal. Some creative inspiration from artists in the EcoEnclose family! 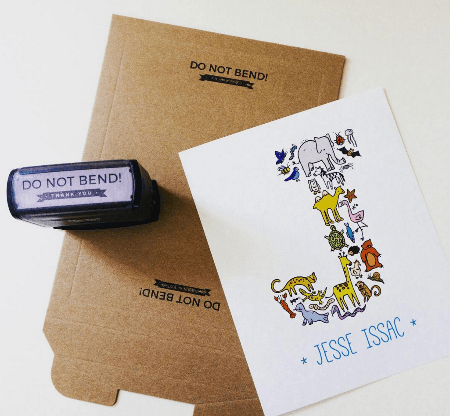 Money and Skip uses the Rigid Mailer, as is, with a stylish “Do Not Bend” stamp. TypeHike uses Triangular Tube (TT) mailers for their posters. Okay, we’ll be honest – even though “accessories and bags” is a good umbrella category in a boutique, it isn’t quite perfect for a product guide. These items are all so different from each other in shape, size and packaging options. Hats and caps: Got a super fancy hat to pack up (think high end cowboy hat!). We suggest a custom cut corrugated box with tissue paper. For other, more bendy hats (think trucker or baseball cap or beanie), our 100% or 88% Recycled Poly Mailers are great options. Jewelry: Do you already have a jewelry box? If so, Padded Mailers are a great option for your shipping packaging. If not, then a custom cut corrugated box (with a cardboard display insert or tissue paper) would work great! You may also like to wrap with GreenWrap, or cushion with Ornament Paper Shred. Small Flap & Seals can also be used to for chunkier, larger jewelry, and then placed in a Kraft Mailer, Padded Mailer or a custom cut corrugated box. Wallets: We recommend a small 100% or 88% Recycled Poly Mailer, Recycled Bubble Mailers, Kraft Mailer, Rigid Mailers or Padded Mailers. Purses or Backpacks: We’ve seen these packaged up beautifully in either a custom cut corrugated box or 100% or 88% Recycled Poly Mailers. Shoes: Use a custom cut corrugated box and ditch the shoe box – saving you materials, time and money. If you already have a shoe box you want to send the product out in, then use a 100% or 88% Recycled Poly Mailer that fits your shoe box. Sandals: Use a custom cut corrugated box, Poly Mailer, Kraft Mailer, Recycled Bubble Mailers, or Padded Mailers. Headbands and Hair Accessories: Poly Mailers, Recycled Bubble Mailers or Kraft Mailers work great! For many of the above, think about if and when a Flap & Seal would help protect and better present your product inside of your main packaging. 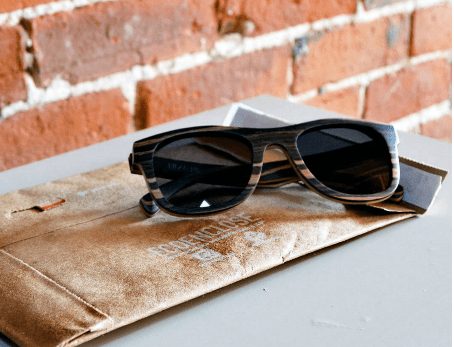 As you can see, most accessories have the option of being packaged in EcoEnclose’s recycled paper or recycled plastic. 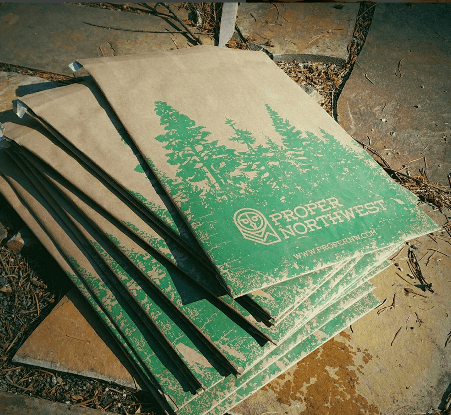 If you haven't read the above sections, you might be struggling with the question - I am trying to be as eco-friendly as possible, so should I use recycled paper or recycled plastic packaging? Unfortunately, it is not a black and white answer. On one hand, paper is made from renewable resources. Our paper mailers and corrugated boxes are made from 100% recycled material, and are recyclable and compostable. This is all great news! But plastic, especially recycled plastic does have its advantages, particularly when it is made from recycled materials as our products are. Plastic is actually more energy efficient to produce and to recycle. Plastic mailers are also lighter than their paper counterparts, so shipping things like poly mailers is more energy efficient. While we can't offer a single, cut and dried answer here, we'd be happy to help you think through the best solution for your product and the planet, so feel free to contact us if we can help! Here’s some inspiration from fellow EcoEnclose customers who produce stylish, sustainable accessories! Sonoma USA uses a custom cut corrugated box for their upcycled bags. Here, Lumbr ships their stunning wooden frames in our Padded Mailers. 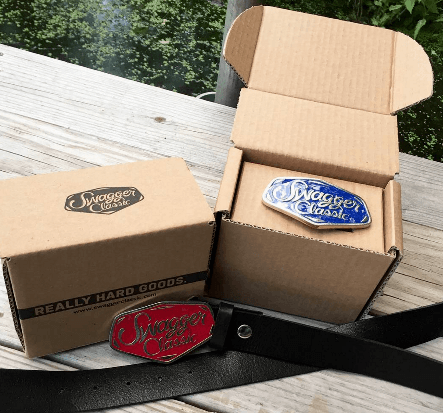 We worked with Swagger Classic to custom designed these beautiful boxes that showcased their belts beautifully for a very cool unboxing experience. 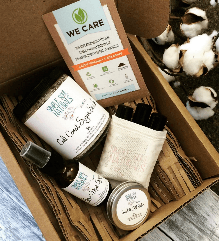 Is there anything better than receiving a box of health and beauty goodies!? If this is what you produce, we suggest two main packaging strategies – both of which will help your products get delivered with as much joy as you put into creating them! Custom cut corrugated boxes : Tab locking boxes work beautifully if you are shipping several different items together, and want to present those items nicely for recipients. We can custom cut the right box size for your needs, and you might consider packaging paper , corrugated bubble , Ornament Paper Shred, or tissue paper to provide some protection and create a great unboxing experience. Some of our customers wrap items up in GreenWrap to give them added protection and a little extra “wow” factor! 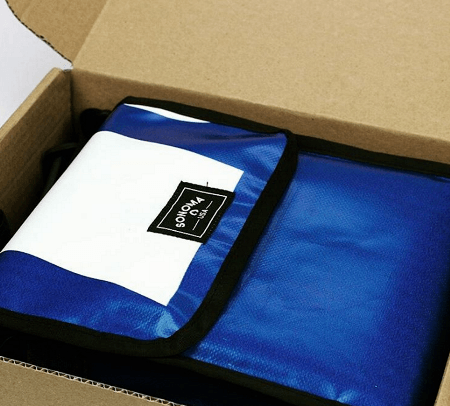 Padded Mailers and Recycled Bubble Mailers: If you’re just shipping one or two items, these protective mailers do a great job providing some protection and holding items in place. Unlike our Poly Mailers, they hold their shape even when an item doesn’t fill them out completely. In some instances, you might also consider a Rigid Mailer instead, however, these tend to be heavier than you might need for beauty and health items. Small items like lipstick and perfume spray work well in a Tuck Box, before packaging them in the shipping box. 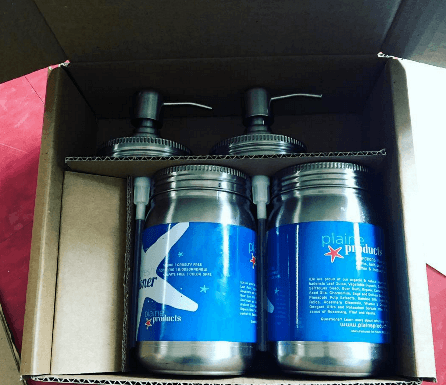 Finally, we are newly experimenting with inserts that hold products in their boxes perfectly, like Plaine Products below. If this is something you might be interested in, let us know and we will see if we can develop something for your needs. Teds Coco uses both Padded Mailers and custom cut corrugated boxes (with GreenWrap), depending on what they are sending out, demonstrating how both beautiful both approaches are! We worked with Plaine Products to develop custom inserts for their corrugated boxes so they can ship their products securely and beautifully.